Well, as we all know things have changed. What used to be done manually has been made easier and faster by Technology. Not only has technology improved our lives but has also made things easier, faster and more effective. Nowadays, technology is usually used in every field, be it education, agriculture and many other fields. When we talk about technology and gadgets, we imagined of phones, tablets and other tech Wearables, but did you know that there are designed technology gadgets that would help improve your health. Following is the Review of Top Five Best Tech-Gadgets and Wearables to Improve Your Body, Health and Fitness. Health is a very fundamental thing in our lives today and sometimes, it gets strenuous always to go to the doctor to help you monitor even the most basic of things. Well, there are gadgets that help you do just that. From monitoring your temperature to monitoring your heart rate, there a lot of things that this gadget can do for you. This is the kind of gadget news that you need to read. There are so many advantages to using these gadgets. It has become an essential part of us as, unlike the olden days where fitness was a non-issue. Today, people are concerned about their weight, their fitness, their diets, and such kind of things. These gadgets help us keep fit by tracking our steps, monitoring our weights, showing us how many calories we get to burn in a single day and many other things. Instead of always consulting medical people for such information, you get to monitor yourself on a daily basis. Yes, these gadgets help save lives. Some of them are used for such crucial matters such as heart monitoring. These are things that could help save life as some of them are life- threatening. For people like the elderly, these gadgets come in handy as some of them have trackers that help locate them when they go missing. If you go through the latest tech videos, you will find more health related info. By helping us monitor and regulate some of these things, they help keep us safer as we can know when things are not well and able to visit the doctor before things escalate. So what are some of these Gadgets? Withings Thermo is the very cool health and fitness gadget that not only looks good on you but is also very much essential. This gadget helps you monitor and regulate your temperature. With this gadget, you can read your temperature in only 2 seconds. Instead of always heading to the doctor for such minor things, you can do this yourself and then head to the doctor when things are not okay. Fitbit Blaze is the only health and fitness wearable that is just over the top. Made by Apple, it goes for $200 but trust me when I tell you that it is every bit of awesome. What makes this wearable so unique is the color of the touchscreen that is very noticeable. It does have other features, but one of its distinct feature is the fact that this wearable comes with Firestar Fitness subscription service that assists you some workouts that could be very helpful and on top of that, this wearable monitors your heart rate while doing these exercises. As we all know, nothing's perfect, and everything pretty much has both its pros and cons. The only con about this wearable is that it is hard to track where you are. 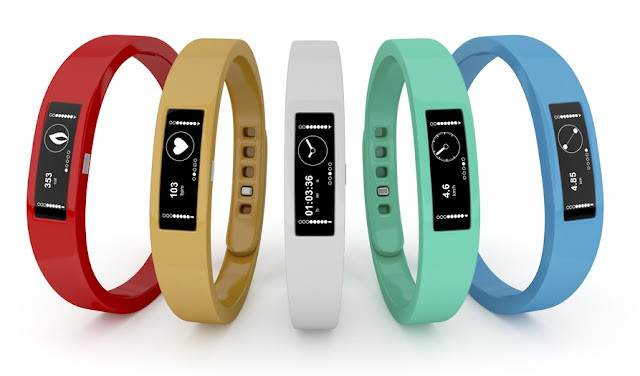 Mira Vivid Wellness Collection wearable is not only pretty but also very useful. Not only is it effective but you can also get it in two finishes, that is the heart of gold and also a pendant necklace that comes in gold. This tracker helps improve your health in many ways such as by monitoring your steps and also showing you some calories that you have burnt in a day. It is a gadget that could help you to keep fit and maintain your weight. Another good thing about it is the fact that it is hidden, and no one has to know that you have it there. Misfit Ray is the kind of gadget that can be used for six months. To top it up, this gadget is water resistant and even comes in two different finishes. It has a sleek design which makes it more eye-catching. This gadget can use a single battery for those six months.